As it turns out, getting the Extraordinary Avatar Expo together has been about as difficult as herding cats. (And there are a set of humanoid cat people in the Expo... and two separately nominated cat women, not to mention a forest diorama of furries, and a cyberpunk diorama with a humanoid robot and a robotic squirrel.) 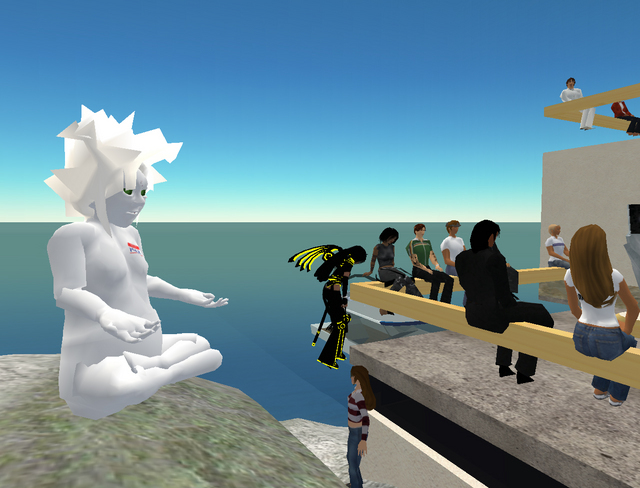 After announcing this convergence to showcase some of the best non-human avatars in Second Life, I got inundated with nominations, a laundry list including a giant gorilla, a dragon, a firebird, and perhaps most strange of all, a bag lady. Over three dozen in all. After a lot of coaxing and wheedling and land management and property rights disputes and requests with Linden management, they're finally there, most of them, in Plum. The only trick now is figuring out how to put them up for a public vote. The original idea was to use a bunch of ancient, Linden Lab-created vote machines, but when it became clear that this would lead to a dispute that would resemble Palm Beach 2000 on acid, that plan was scotched. So now a Resident is creating a whole new vote machine for this Expo, which will enable all 40+ nominees to be listed, and every Resident to vote on up to ten. Trouble is, the vote machine's creator, Max Case, is a bleach-white, big-hair alien who is also a nominee in the Expo. Which sort of threatens to become a dispute that would resemble, I dunno, Diebold touch-voting in Ohio on acid and amyl nitrate. Fortunately for us, Max has promised to post the code to his voting machine on a public forum, so every nominee can make sure there's no backdoor hack that magically gives Max Case a few hundred extra votes, then entrust code and machine to me for safe keeping. Too bad Diebold didn't think of doing something like that. Anyway, voting should begin later this week-- before or after a runway show of exceeding weirdness, that is. » U.S. Troops Clash With Shiite Militiamen from Between U.S.
Well, in the end, I haven't posted the code, cuz it's not all nice and purty as i had hoped. (i have to make a v2.) Also, as those familiar with SL can attest, me posting the code would prove nothing, as currently (afaik) there is no way to make signed code in SL, so what I post isn't necessarily whats in the machine. In the end, Hamlet was given an open copy of the machine, which can be checked over by whoever he likes. (ideally, a Linden).